Abstract Coils, 2017. Screen print. Limited edition 10. 24K gold leaf on paper. 47.625" x 33.5"
Abstract Various Screen print. Limited edition 10. 24K gold leaf on paper. 29.5" x 37.25". Rounds Negative, 2017 Screen print. Limited edition 10. 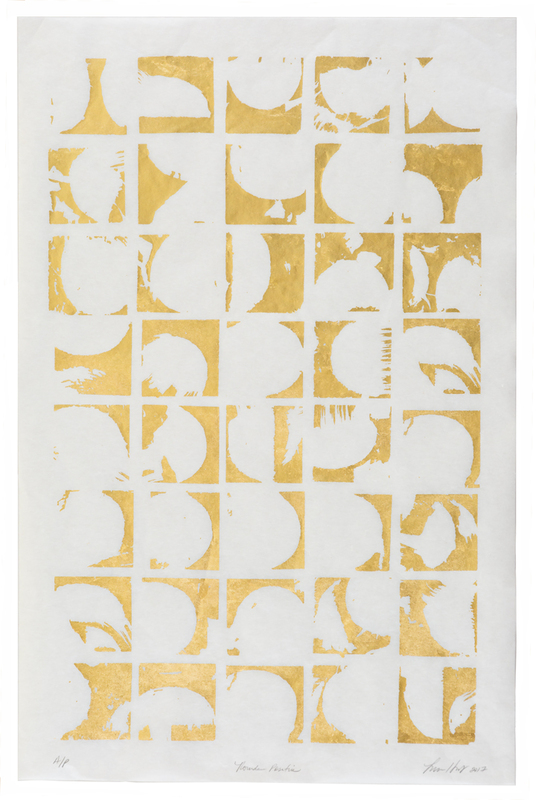 24K gold leaf, Misu Rice Paper. 22" x 32"
Rounds Positive, 2017 Screen print. Limited edition 10. 24K gold leaf, paper. 22" x 32"
Rounds Positive, 2017 Screen print. Limited edition 10. 24K gold leaf, Misu Rice Paper. 22" x 32"
Rounds Negative, 2017 Screen print. Limited edition 10. 24K gold leaf, paper. 22" x 32"